There are many projects during an auto's restoration where several processes must come together to achieve the final desired results. 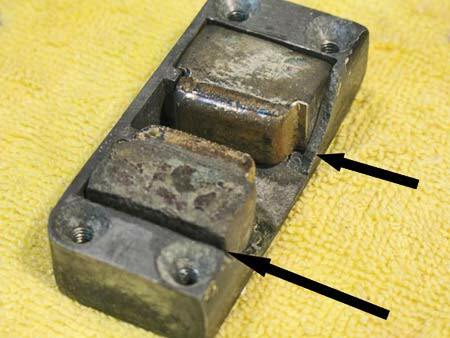 Rebuilding this 1920's era town sedan's anti-rattle door bumper assembly is a good example. This door bumper is used in the door jamb to provide a degree of tension to keep the doors from rattling against the body's jamb and sill plate. These door bumper assemblies were used by Lincoln and by other manufactures. It has essentially two parts, the wedge side, mounted in the door and the receiver side that mounts in the door jamb. Under the decorative cover of the receiver part is an enclosure that holds two rubber based friction blocks with slightly tapered rectangular metal cups. Our original door bumper receiver has a couple of things going against it: Old brittle pot metal and old hardened rubber. 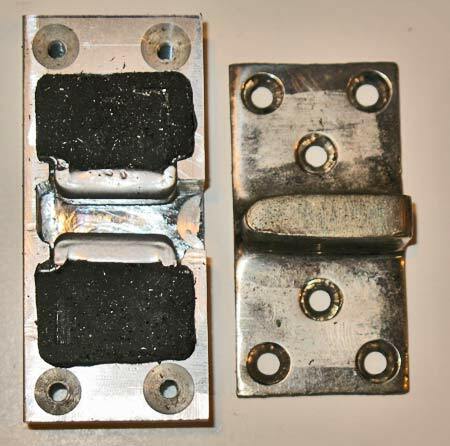 It's not certain how it happened, but it appears that the rubber blocks hardened over time and with repeated door closings, the hardened rubber pushed against the pot metal housing, fracturing the thin wall facing the wedge. Another theory is that the door sagged and the wedge pounded into the pot metal housing. Given that pot metal is not very strong and repair is difficult, we decided to replace the enclosure. The new, stronger enclosure should provide years of reliable service. This article covers the methods used to replace both the enclosure (housing) and the rubber block assemblies. The door bumper receiver with the decorative shroud covering the pot metal housing. 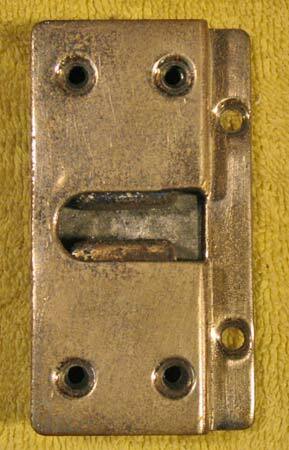 The same door bumper receiver with the decorative shroud removed to show the rubber blocks and the metal cups. Close up view of the pot metal housing the damaged edge on the right. Also note the gap between the lower rubber block and the bottom of the housing, the result of shrunken rubber over the years. 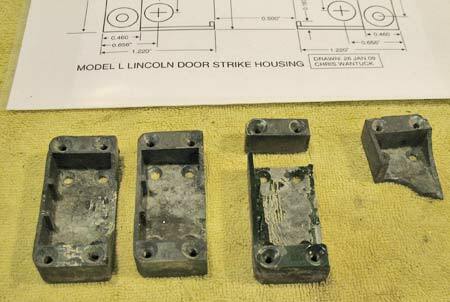 Please note: When we were in the process of working on our housings, these Lincoln bumper housings became available through Classic & Exotic Service, Inc. While it may make sense to just purchase the Lincoln enclosures, they aren't necessarily available for all cars using this type of door bumper. The processes shown here may be applicable to replacing door bumpers for those other models. 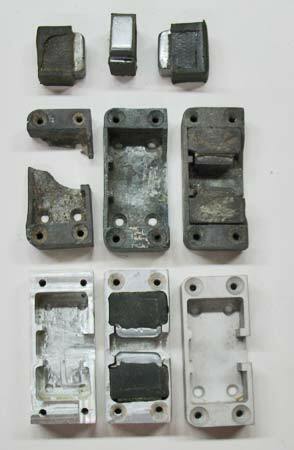 At top are the original rubber blocks, center are the original broken housings and at bottom are two hand machined housings alongside one of the die cast versions from Classic and Exotic. To construct our housings, we first make a drawing based on the dimensions using various broken pot metal pieces. After close examination, we assumed that the upper and lower halves are symmetrical. The drawing shows dimensions referenced from two sides. Fortunately one of the enclosures had was complete enough that we could useit as a drilling pattern. Eight holes total are required, four inside countersunk holes that are located under the rubber blocks and four outside holes retain the decorative shroud. The four outside holes are drilled slightly smaller and will be tapped for a 10-32 screw. The remains of a door bumper housing originally cast in pot metal. Some of the pieces are intact enough to extract useful dimensions, otherwise this housing has deteriorated too much to be repaired. The reference drawing that will be used is in the background. The original housing is used as a guide for drilling the eight holes into the solid aluminum block. Using a drill press ensures their perfect alignment. 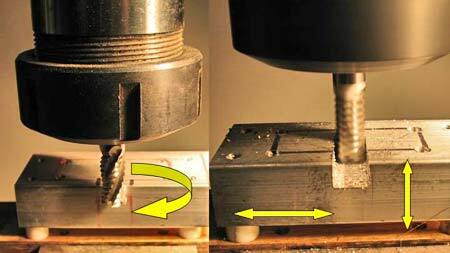 Simple machining in the context of this article is a systematic removal of material to create the desired shape and dimensions from a block of material. Industry professionals refer to this as Hogging Out. Aluminum was selected for this project (given its ease in machining) from Speedy Metals. In this milling operation, the cutter is fixed and spinning at high speed and the work piece is slowly moved back and forth. Our "systematic" approach is necessary because the steps taken and their order have a significant bearing on the outcome. In this case as in most, planning is everything. Drilling, cutting, cutting depth, clamping or holding, tool bed back-lash, tool cutting speed, and cutting direction are just some of the terms and operations that are performed here. A closer look at the broken pieces and the drawing reveal an important clue: The four outside holes that are tapped with a 10-32 thread. These threaded holes are intended to hold the decorative cover over the front. Conveniently forus, they can also be used to hold the block of material from the underside onto a scrap piece of material. 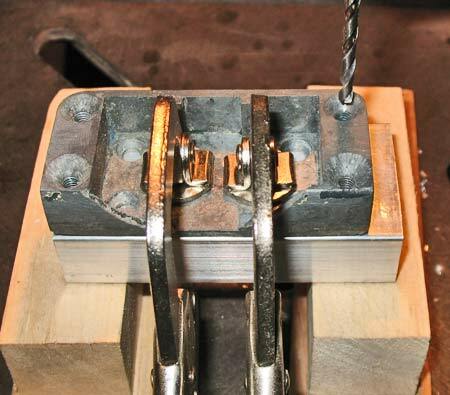 This lets us lock the material in the vise while performing all the milling operations from the top. The four outer holes are tapped size 10-32 using a hand tapper to ensure straight alignment and used to hold the aluminum workpiece onto a hardwood block. Small 1/4 inch nylon spacers elevate the block so the milling machine cutter will machine the entire outside edges. Shown here is a roughing bit that is designed to aggressively remove a lot of material during the milling operation. The machining process is performed in two stages, a roughing phase and a finishing phase. The roughing part uses a cutting bit spinning at high speed that is slightly tapered and has edges (called flutes) that facilitate the fast removal of the metal cuttings. The roughing process is not intended to make the cuts in the material look pretty or be close to the end tolerances, but rather aggressively remove as much material as possible. In contrast, the finishing stage uses a variety of thinner cutting bits to precisely cut the material to the exact dimensions. Finish machining is applied to both the outside and inside edges. While cutting inside edges, the thinner the cutting bit the more accurate the cuts and the tighter the corners will become. Refurbishment of the rubber blocks begins with separating the metal cups from the old hardened rubber. Once seperated, the years and layers of paint overspray are easily removed. The metal rectangular cups could be sent to a plater, but only the edge is visible through the metal shroud. To control costs, we decided to powder coat these metal cups in silver and given the part's purpose, it seemed adequate enough. Sheet plastic is cut into strips and segments used to assemble the eight molds for the rubber blocks using Cyanoacrylate adhesive (super glue). Note the flat segment under each side that holds the metal cup and serves to suspend the mold. The eight plastic molds are ready for the Devcon 80 liquid rubber. The plastic molds are held together using Cyanoacrylate adhesive (super glue). The metal rectangular cups have already been powder coated and are placed in the bottom of the molds. Note the molds are elevated on the wooden strips to allow the cups to sit at the bottom of the mold. The liquid rubber used for this project is Devcon 80, a Urethane based flexible compound that has a Shore A hardness rating of 80. The Shore A scale ranges from 20 which could be a soft foam rubber to 100 which is very hard rating, close to the rating of the heel on an expensive shoe. Based on the scale provided by Devcon, a Shore A hardness of 80 seemed too hard for this application. Some sample mixing confirmed that a Shore A rating of 50 would be more appropriate for this project. The Devcon Flexane compound is mixed with its hardner at a ratio of 77:23 which is by weight, but the Flexane Flex-add is mixed soley by volume (in ounces). To soften the rubber to our desired hardness, we used Flex-add. It softens the Devcon Flexane mixture: the more you add, the softer the cured compound, but it also increases the curing time. 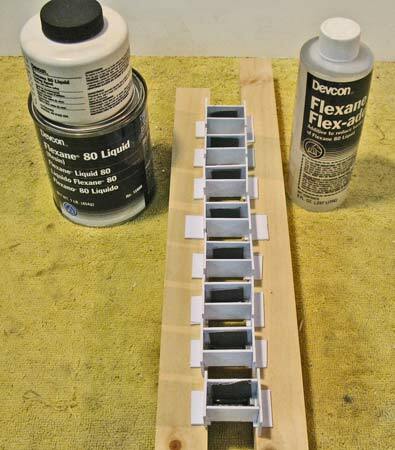 A digital postal scale set to the grams scale makes quick and accurate mixing of the basic Flexane compound with four ounces of Flex-add and then poured into the molds. We suggest filling the molds to the top as some leakage is likely down the sides of the molds during the curing process. Any excess on the top can be trimmed down after curing. The Devcon 80 liquid rubber (urethane) requires careful mixing. The basic material is mixed according to weight and the softening agent is mixed according to volume. This postal scale set to grams and zeroed to account for the weight of the cup makes quick work when mixing the 77:23 ratio for a total of 100 grams. 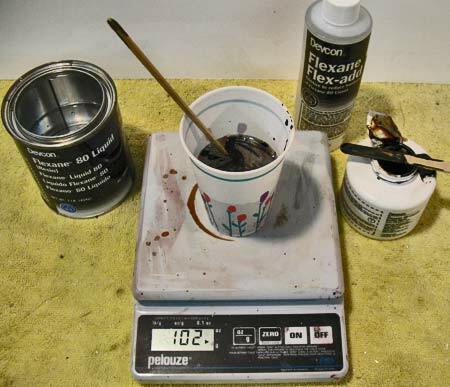 Approximately 4 ounces of softening agent changed the mix from a shore hardness rating from 80 to 50. 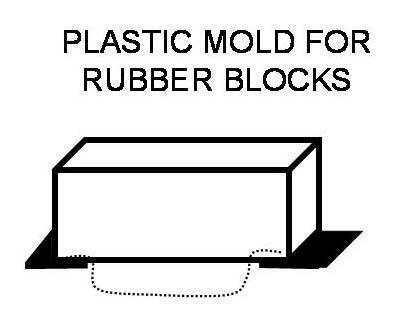 Once the rubber blocks have cured and removed from their molds (approximately 24-32 hours), any residual rubber that weeped onto the metal cup's side is easily removed. The blocks are trimmed with a sharp hobby knife and in some cases can even be trimmed and shaped using a belt sander. The blocks should fit snuggly into the machined housing. The completed hand machined housing with the rubber blocks installed. Pictured is the receiver housing with its companion wedge to show relative size and position. Note: The wedge on the right is flipped over to show its relative mating into the completed housing. 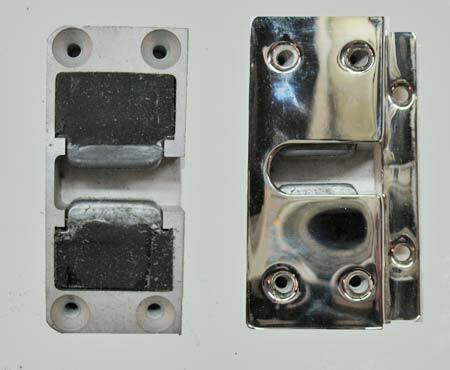 When mounted on the door, only the wedge portion makes contact into the housing. As we mentioned these door bumpers are now available from Classic and Exotic Service. 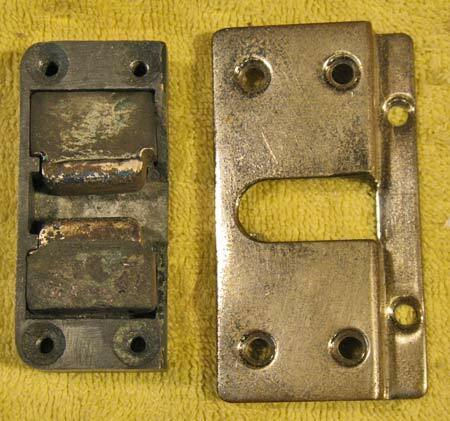 Shown here is the completed housing with the rubber blocks installed (left) and with the decorative nickel plated cover over it (right). Devcon Flexane is available from several sources such as McMaster-Carr and Grainger. www.mcmaster.com and www.grainger.com An Internet search will provide others as well.